I like the story of Hercules in Sagittarius; it is the story of the Stymphalian birds. The birds had migrated to Lake Stymphalus in Arcadia to escape a pack of wolves. 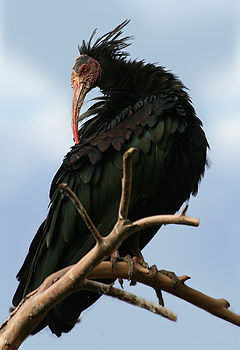 in 1987 Swiss ornithologist Michael Desfayes suggested that they may actually have been based upon a real (and harmless) bird, the bald ibis, now restricted in Europe to a single locality in Turkey. When the sun is in the sign of Sagittarius, the evenings darken and the rain season in Greece starts, creating swampland from previously dry areas. The constellations Cygnus the Swan, Aquila the Eagle, and Lyra rise during this time period. In this story Hercules task is to rid the marshes of the Stymphalian birds. Cruel, fearce and large with beaks and talons made of brass, they were consuming the crops and killing the inhabitants. And the noise they made was overwhelming. Athena asked Hephaestos to make divine cymbals for Hercules. Covering his ears with pads, he clashed the cymbals together. The din was so loud and awful to the birds that they left in confusion. I think the point is this. The noise they were making was the noise of the unquieted mind, producing thought forms. Apparently, there were three major birds and lots of smaller ones. The birds were the various thought forms. The major birds were cruel gossip; talk of the self, selfish talk; and casting of pearls before swine. Paradoxically, the sound that Hercules produced to combat them was the sound of the silence. Sagittarius is the sign of silence. Before the soul can hear, it must first become deaf to roaring and whispers. Before the soul can comprehend, it must first be united with the silent speaker. For then the soul will hear and remember, and then the inner ear will speak.